Benny Cenac, CEO of Cenac Marine Services and owner of Golden Ranch Farms, has partnered with 4:13 Outdoor Ministries to make a young man’s dreams come true. Cenac and the Golden Ranch team donated a hunt at Golden Ranch Farms to young Cameron Pounders, a 12-year-old from Walker who has muscular atrophy. The farm sits on 50,000 acres and houses several species of wildlife. On the hunt, Cameron was able to harvest an 11-point buck and a nice, mature doe. Pictured are, from left, Cameron Pounders and Warren J. Coupel Jr., president of 4:13 Outdoor Ministries. 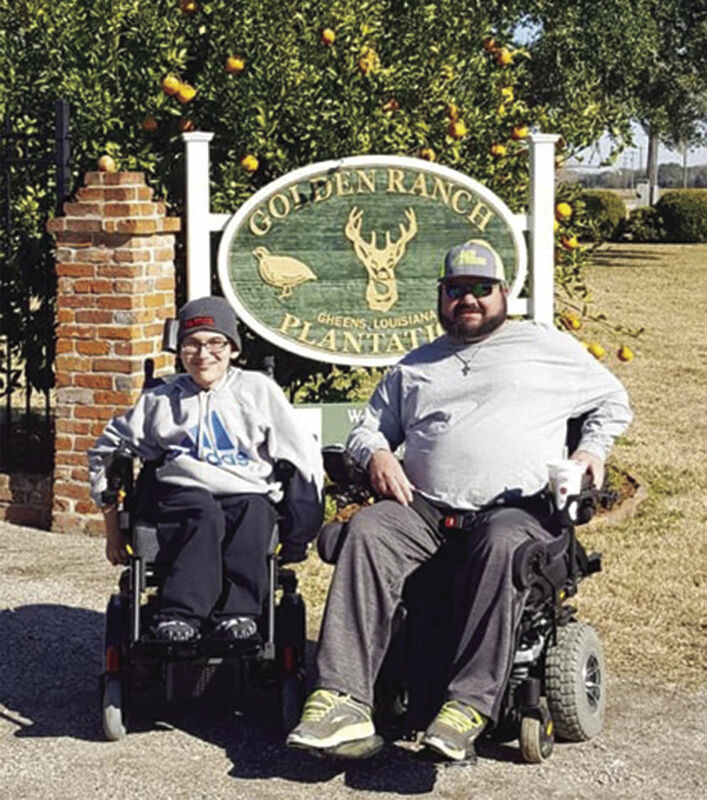 Benny Cenac, CEO of Cenac Marine Services and owner of Golden Ranch Farms, and the Golden Ranch team donated a hunt at Golden Ranch Farms to young Cameron Pounders, a 12-year-old from Walker who has muscular atrophy. From left, Cameron Pounders, Josh Kaplan, Blake Nash, Madelyn Pounders, Wesley Pounders, Cadence Coupel, Holly Hassler, Hunter Coupel, Warren Coupel, Ryan Bales, Steve Cavalier, Golden Ranch employee. 4:13 Outdoor Ministries is a faith-based 501 (c) 3 organization that caters to disabled children and veterans. The goal of the ministry is to sponsor fishing trips, hunts and faith-based camps for those who aren’t able to afford these adventures or in prime physical condition to go on these outings. Most of the staff at 4:13 Outdoor Ministries are disabled individuals and veterans as well. Cenac and the Golden Ranch team recently donated a hunt at Golden Ranch Farms to young Cameron Pounders, a 12-year-old from Walker who has muscular atrophy. The farm sits on 50,000 acres and houses several species of wildlife. On the hunt, Cameron was able to harvest an 11-point buck and a nice, mature doe. Cenac and the rest of the staff at Golden Ranch are happy to be a part of such a faith-driven, compassionate cause. Not only does the organization focus on funding and raising funds for the disabled, veterans and at-risk youth, it also participates in sponsoring, helping raise funding, or donating to great causes like the American Cancer Society, Bayou Autism Chapter, Community Worship Center, Dreams Come True Foundation, and The Church International. The organization has also done disaster assistance in Assumption Parish for tornado relief, serving almost 8,000 meals in a week. Aide was also offered in the Great Flood of 2016 by providing food to areas and neighborhoods that were impacted. 4:13 Outdoor Ministry will continue in its endeavor to help and serve those in need on an as-needed basis with the help of supporters, sponsors and donations like they generously received from Benny Cenac and Golden Ranch. For more information on 4:13 Outdoor Ministries, please visit, www.413outdoors.org. MORNING UPDATE | Livingston Parish headlines from February 26, 2018! Check out these Livingston Parish headlines from February 26, 2018!